Who hasn't heard of the TV show, Portlandia? I mean, really? I feel like it's one of those shows everyone and their mother has heard of and either loves it to pieces or hates it with a vengeance. My husband and I? We secretly kind of like it to pieces. We did love it to pieces when it first came out, but as seasons go on, we are sort of like, "Ehhhhhhh....ehhhhhh..." It's becoming a little much for us. But that's besides the point. When I heard they put out a cookbook I was like, "Whaaaaaaaaat?!? Whaaaaaaaaaa????" I needed immediately. I was so intrigued! I mean, if you've seen any one of their episodes, food is a BIG part. There's at least one food related sketch in every episode. Which, I love. So I was excited to see how they incorporated their humor and show into a book! And a cookbook at that! My favorite sketches? In season 1 when Carrie and Fred go to a fancy restaurant and order chicken. But not just any chicken, they need to know if it's organic, what it was fed, where it is from, etc etc. It doesn't stop there...before actually ordering their meal they actually take a trip out to the farm to see the chicken and meet the farmer and so on. It's great. Second favorite- "We can pickle that!" Which basically pokes fun at the fad that was going around a while back where everyone was pickling everything! 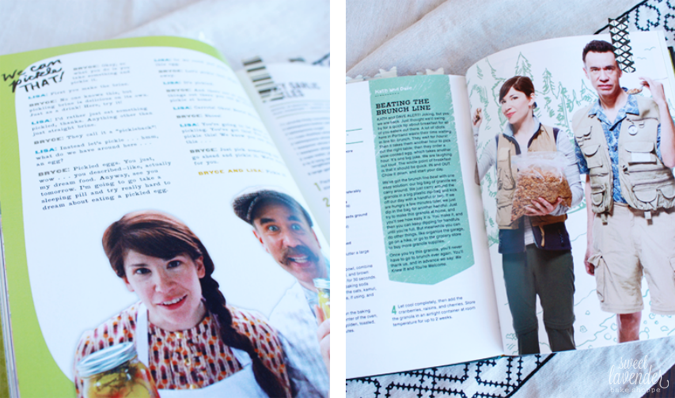 This is probably my favorite part about this cookbook- there are little Portlandia inside jokes from some of their more popular sketches within the pages. I was soooo happy to see two whole pages devoted to my favorite, "We can pickle that!" Bryce: Okay, so what you do is you take something and pickle it. Lisa: What do we have around here...an egg? Bryce: Pickled eggs. You just, wow...you described-like, actually my dream food. Anyway, see you tomorrow. I'm going to go take a sleeping pill and try really hard to dream about eating a pickled egg. Lisa: Or we could just pickle this egg. Bryce: Let's pickle that. Right away. There are so many other things you can pickle at home! Lisa: Carrots! Okra! Beets! Broccoli! Bryce: Shoes! Just pick something and go ahead and pickle it. We're rooting for you. Then there's a real, I mean really delicious sounding actual recipe for Spicy Garlic Pickles, which I tabbed because it actually sounds amazingly delicious. 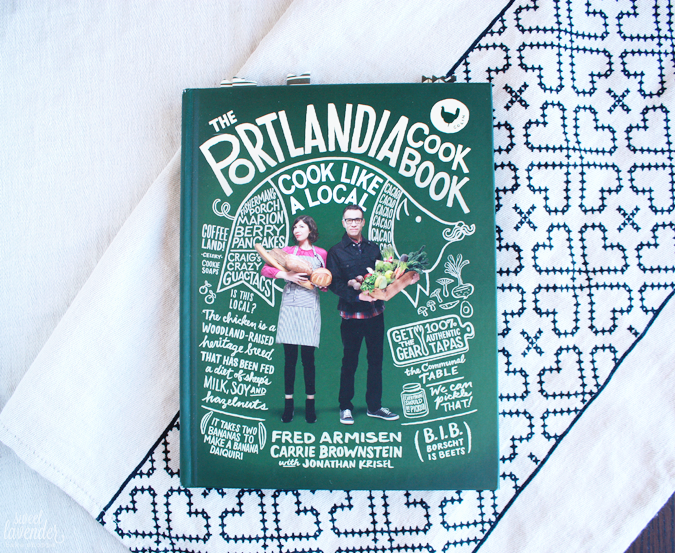 The pages are laid out in a fun, comic-y, scrapbook style with some devoted to funny little show excerpts and others devoted wholeheartedly to actual recipes from real chefs. The chapters are broken up into Small Plates, Main Courses, Desserts, Drinks and Brunch and I've tabbed recipes like the Tortilla Espanola, Butterflied Chicken Roasted over Bread and babysitter's Mac and Cheese. The Mac and Cheese is really calling my name. 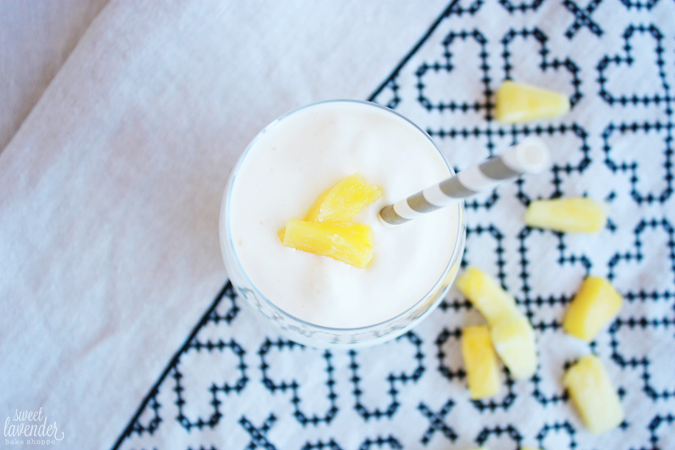 Being the new year and all, I decided to go for a healthier approach and try out their Mango Lassi Smoothie recipe. Seemed simple enough, full of nutrients my body craved, and super fun to make. Then my store was out of mango (what?) 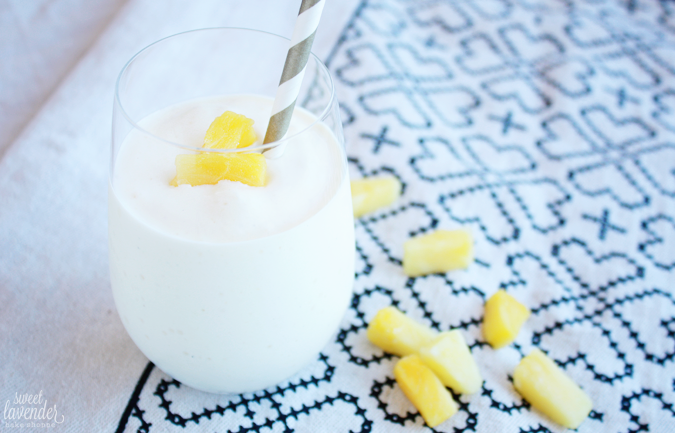 so I changed it up a bit with pineapple. Ooooops! Verdict? Super creamy, thick and delicious! I love when my meals are made in a jiffy and super good for me! And when made with 0% plain greek yogurt, this whole entire recipe is only 270 calories with a whopping 16g of protein!!! YES! Eat alone or share with a friend...either way, make this yesterday. 1. Take out pineapple chunks and let sit room temperature for 10-15 minutes to very slightly defrost. 2. Add all ingredients to a high powered blender or food processor and puree until completely smooth, thick and creamy. *I received this book from Blogging for Books for a review, all photographs and opinions are my own. These photos are beautiful and this sounds so delicious! Did you go to Trader Joes? Because they were out of mango when I went two nights ago! 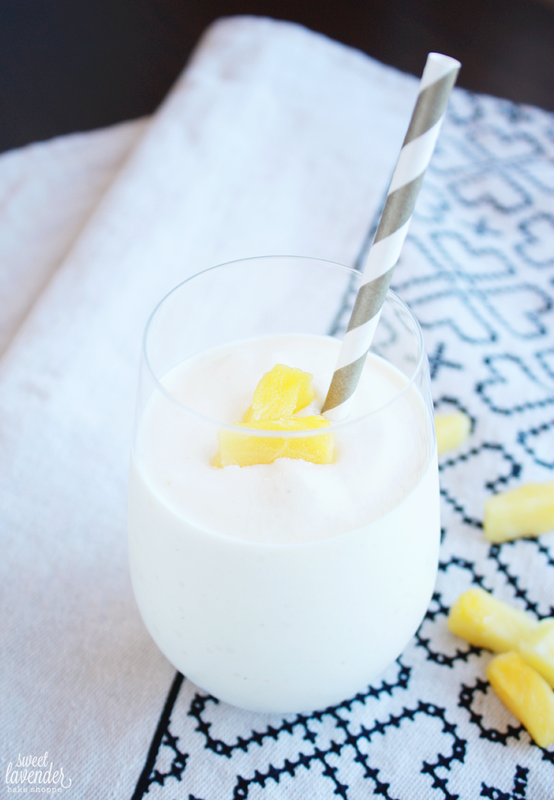 I bought pineapple instead, which is perfect timing for this recipe! Also, thanks to Portlandia, I always laugh when someone says the word cacao. Thank you so much for the really kind words! YES! Trader Joe's! My most beloved store. But really, I'm glad they WERE out because the pineapple was crazy delicious. Added that second note- bit of acidity that mango wouldn't have, you know? Awe thank you! So hope you're able to try it!